The route I chose was the bike highway that connects Delft and Rotterdam. It starts on Rotterdamseweg neat TU Delft and continues along the Delftse Schie and then along the Delfshavense Schie. This route goes through Delft, Zweth, Kandelaar, Overschie, Spangen, Middelland and Nieuwe Werk. All of the areas listed with the exception of Delft are considered to be a part of Rotterdam. The route is relatively straight forward which is nice to connect Delft to Rotterdam. It follows the Schie canal for the most part and then takes one turn which continues all the to the Maas Tunnel. The only times there are intersections are when you get deep in to Rotterdam, the use of overpasses allows for the bike highway to continue uninterrupted. The majority of the route was cycle track making travel easy and less stressful. There was a point on the route that was high stress throughout the town of Overschie where the route became shared with cars. The surface of the route became rough so cars would go slower, but this also made the route less enjoyable to cycle on. There was also an area in Zweth that had mixed traffic, on-street parking and chicanes. There was no real space for bikes in the area, and at one point two passing cars almost hit us even though we were as close to the parked cars as possible. If these two areas could be changed, this bike highway would be perfect and be low stress at all times. The bike highway could be separated into 5 specific segments. Segment A is the countryside portion from Delft to Overschie, where the path is mainly cycle track along the canal, but switches to advisory lanes at times. Segment B is the village area in Overschie that is brick surface where cars and bikes share the road. It was a fairly old road so the riding surface was not too comfortable, as mentioned earlier. The road becomes narrow and has many curves, which slows down the cars and bikers. Segment C begins when you exit the village area and contains a large speed bump to ensure bikers entering from Segment C to Segment B will have slowed down when they enter the village area. Segment C contains the stand-alone path that continues along the canal and is the most peaceful of all the segments due to its complete separation from other modes of traffic at all times. Segment D begins when you exit the countryside area of Rotterdam and enter the city portion, this is also when the stand-alone path ends a cycle track next to main roads begins. Section E is the Maas Tunnel, which can only be accessed by entering the building to the right of where the cycle track of Segment D ends. You must use the escalator in the building to get to the tunnel. Below is a map displaying the segments described above with photos of what riding along each segment looks like. The points on the map represent changes of bike infrastructure along the route. The route was 9.2 miles long. It contained 4 stoplights, 0 roundabouts, and 8 road overpasses. At one point along the route bikes had to yield to traffic and there was lighting for about 100% of the route. With regards to biking on the route itself, it was 70% cycle track, 15% stand-alone path and 15% on-street. The route was straight forward, there was only one turn that had to be made along the route. This turn was at Overschiese Doprsstraat and Delfshavenseweg and could have been advertised better, at least for someone new to the area. There were many signs along the route showing where each town or city was with a distance marker on the sign as well. 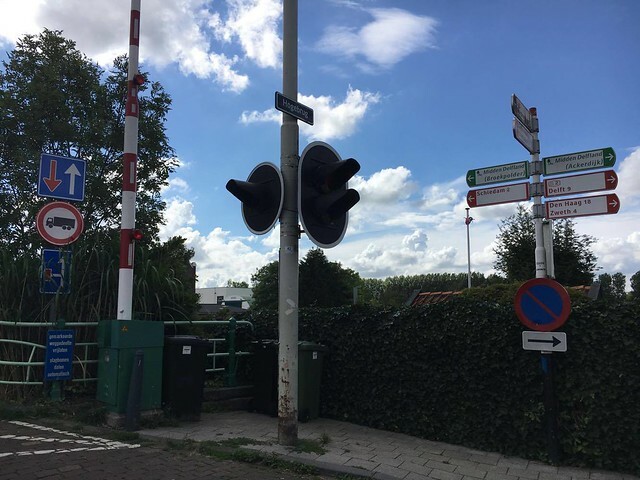 Below is the image of signage in the village of Overschie where the turn above needs to be made to continue along the route. To me at least, the signage was not enough to tell me to turn to continue on the bike highway, so I continued straight and got lost for a short while until retracing my steps. Another point of confusion was the signage for the Maas Tunnel. The building did not really have anything outside of it signifying that the tunnel was underneath, so that could be more helpful. I would consider the route complete in the fact that you do not have to leave the route at any point to continue towards your destination, but some improvements could definitely be made. The village of Overschie could be more bike friendly, and the area in Zweth with chicanes and parked cars definitely needs to be changed because I did not feel safe along that strip. Removal of the parked cars could allow for a bike lane or even a cycle track that goes around the chicane. Along the route you get to travel past the Euromast, this was my favorite part of the route that was non-transportation related. 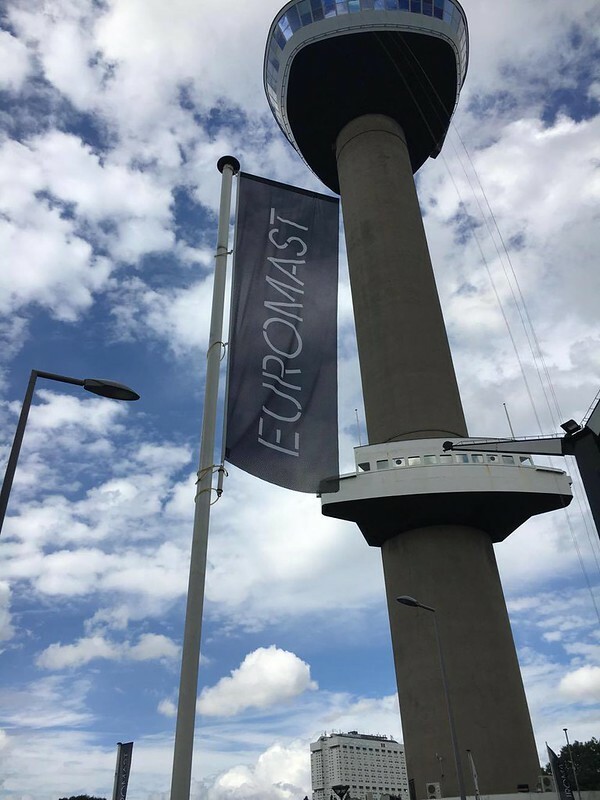 The Euromast has a beautiful view of the city and also allows for people to repel off it via cables, so if you wish to visit this attraction this bike highway can lead you to it. This bike highway overall was fast, easy and convenient. If you were looking to travel to Rotterdam from Delft without taking the train, this route is definitely the one to take. The Maas Tunnel was also very enjoyable to ride along; to imagine that it was built so long ago is fascinating.